4. George Wood. Son of Peter Wood & Janet "Jessie" Cleghorn. Born 27 Dec 1838 in Roxburghshire, Scotland. 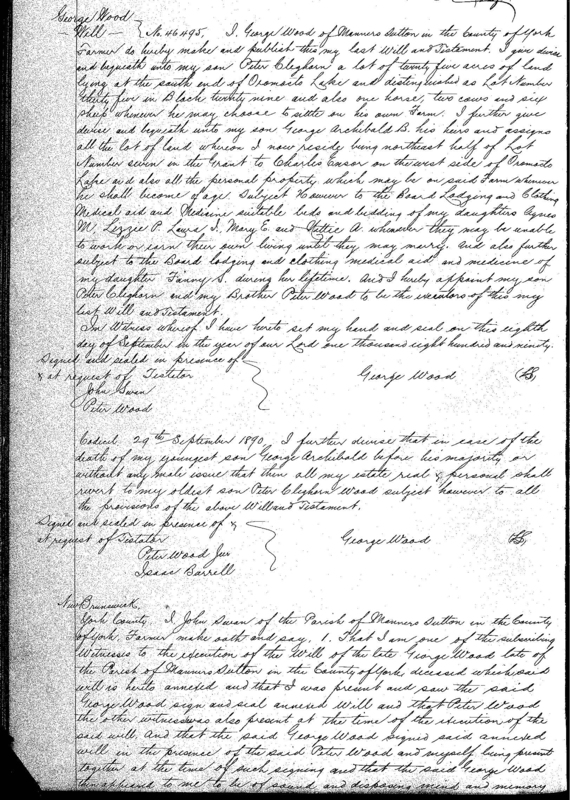 Christen 10 Feb 1839 in Eckford, Roxburghshire. Died 5 Oct 1890 in Tweedside. Buried in Harvey Settlement Cemetery. From parochial registers of Eckford in Roxburghshire (Researched by Bruce Elliott, 2004): 1838 Peter Wood Mason Ormiston and Jess Cleghorn his wife their child Born the 27th Decr 1838 and Bapt. 10th Feby 1839 named George." He married Margaret "Maggie" Piercy, daughter of Matthew Piercy & Agnes Moffitt, 20 Apr 1867 in Waverley House, Fredericton By Rev. Dr. John M. Brooke . Born 2 Jul 1849 in Harvey, NB. 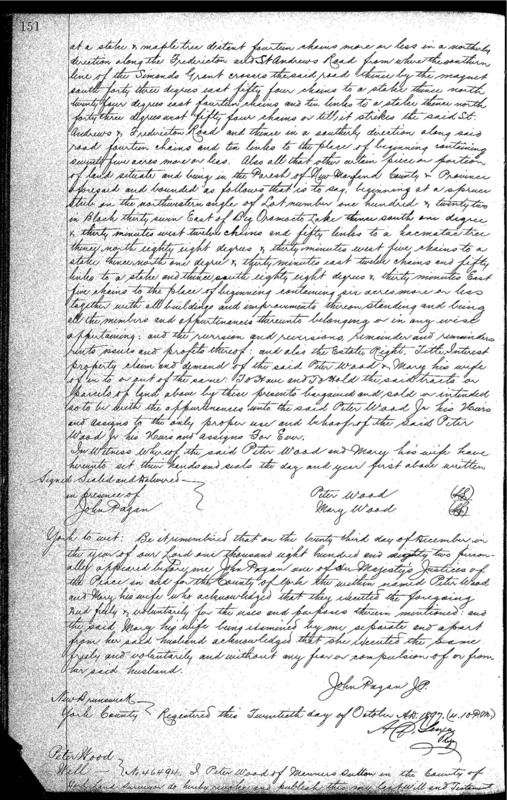 Christen 29 Nov 1849 in Harvey By Rev. Daniel McCurdy. Died 19 Feb 1889 in Tweedside. Buried in Harvey Settlement Cemetery. 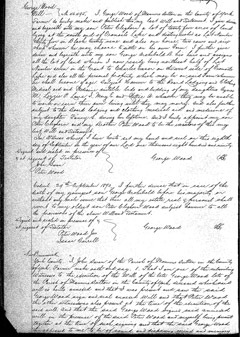 From Headquarters, 24 Apr 1867: "Married Waverley House, 20th inst., by Rev. Dr. Brooke, George Wood and Miss Margaret Piercy, both of Harvey Settlement." Witnesses to marriage were Robert Swan and Emmeline Smith. 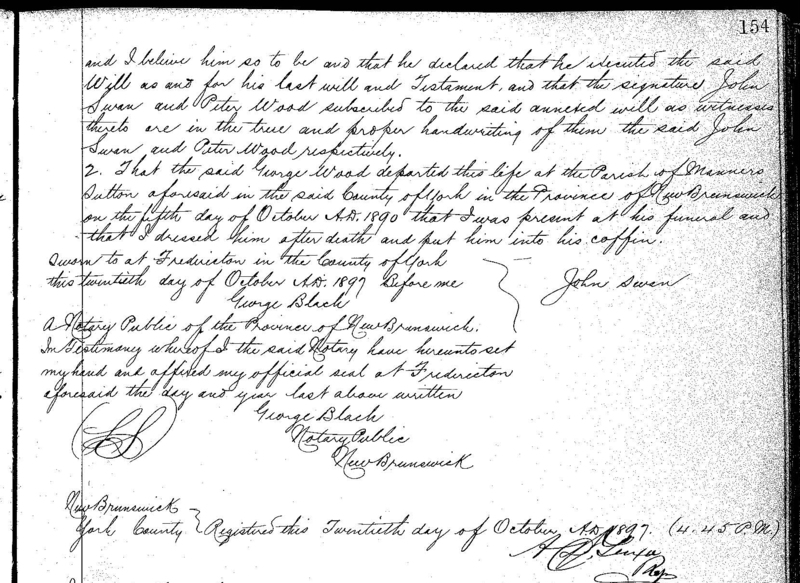 Last will and testament of George Wood, Son of Peter Wood & Janet "Jessie" Cleghorn. Born 27 Dec 1838 in Roxburghshire, Scotland. Christen 10 Feb 1839 in Eckford, Roxburghshire. Died 5 Oct 1890 in Tweedside. 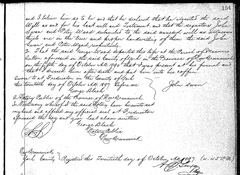 A transcription of the will for the site would be greatly appreciated. Source: Norman DeMerchant, Fredericton. 27 Mar 2009.